Which TV shows are doing the best? The worst? Cancelled or renewed? Wondering how your favorite series are doing in the ratings? Here are the season average ratings of the 2018-19 network TV shows — through the end of week 27 (Sunday, March 24, 2019). ABC shows (so far): 20/20, The Alec Baldwin Show, America’s Funniest Home Videos, American Housewife, American Idol, The Bachelor, Black-ish, Child Support, The Conners, Dancing with the Stars, Dancing with the Stars: Juniors, The Fix, For the People, Fresh Off the Boat, The Goldbergs, The Good Doctor, The Great American Baking Show, The Great Christmas Light Fight, Grey’s Anatomy, How to Get Away with Murder, The Kids Are Alright, Match Game, A Million Little Things, Modern Family, The Rookie, Schooled, Shark Tank, Single Parents, Speechless, Splitting Up Together, Station 19, Videos After Dark, and Whiskey Cavalier. CBS shows this season (so far): 48 Hours, 60 Minutes, The Big Bang Theory, Big Brother: Celebrity Edition, Blue Bloods, Bull, Criminal Minds, Fam, FBI, God Friended Me, Happy Together, Hawaii Five-0, MacGyver, Madam Secretary, Magnum PI, Mom, Murphy Brown, NCIS, NCIS: Los Angeles, NCIS: New Orleans, The Neighborhood, Ransom, SEAL Team, Survivor, SWAT, The World’s Best, and Young Sheldon. CW shows this season (so far): All American, Arrow, Black Lightning, Charmed, Crazy Ex-Girlfriend, DC’s Legends of Tomorrow, Dynasty, The Flash, Legacies, Riverdale, Roswell New Mexico, Supergirl, and Supernatural. 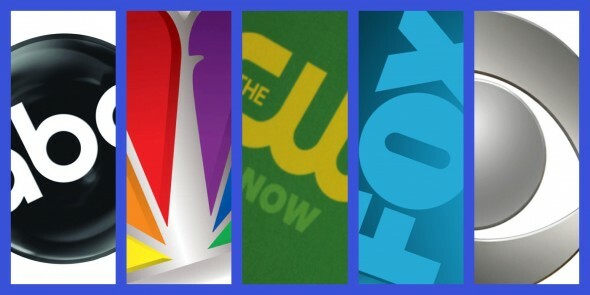 FOX shows this season (so far): 9-1-1, Bob’s Burgers, The Cool Kids, Empire, Family Guy, The Gifted, Gordon Ramsay’s 24 Hours to Hell and Back, Gotham, Hell’s Kitchen, Last Man Standing, Lethal Weapon, The Masked Singer, MasterChef Junior, Mental Samurai, The Orville, The Passage, Proven Innocent, Rel, The Resident, The Simpsons, and Star. NBC shows this season (so far): America’s Got Talent: The Champions, AP Bio, The Blacklist, Blindspot, Brooklyn Nine-Nine, Chicago Fire, Chicago Med, Chicago PD, Dateline NBC, Ellen’s Game of Games, The Enemy Within, Good Girls, The Good Place, Hollywood Game Night, I Feel Bad, Law & Order: Special Victims Unit, Manifest, Midnight Texas, New Amsterdam, Superstore, This Is Us, The Titan Games, The Village, The Voice, Will & Grace, and World of Dance.